In the winter we’re sometimes presented with an identification challenge at the bird feeder. Most of us see house finches on a regular basis because they’re resident throughout the U.S. but now we may see a similar northern visitor: the purple finch. Purple finches (Haemorhous purpureus) breed in the coniferous forests of Canada and the northeastern U.S. and move south in winter, sometimes irrupting as far south as Florida. Unfortunately they’re less common than they used to be. In eastern North America their population declined from 1966 to 1994 as the house finch population moved west. Partners In Flight estimates there are about 3 million purple finches in North America. The house finch (Haemorhous mexicanus) was originally from the western U.S. and Mexico but bird sellers illegally captured and sold them as “Hollywood Finches” in New York City. In 1940, with law enforcement in pursuit, the dealers released their birds in Central Park. Since then, the eastern population has expanded westward, out-competing purple finches as they go. House finches are very successful birds. Partners In Flight estimates there are about 16 million of them. Purple and house finches look alike but they’re different. For starters, purple finches are slightly misnamed. Instead of dark purple the males look as if they were dipped headfirst in rose-colored berry juice (a description attributed to Roger Tory Petersen). Their heads, necks, backs and wing coverts are rosy-over-brown, their rumps are pure rose-color and their breasts are striped and dotted with rose. Male house finches are mostly brown with pale red or orange-red painted on their heads, breasts and rumps. Their backs are brown and though their chests are red at the top their flanks are striped with brown. They look a bit daintier than purple finches with a thinner neck and smaller beak with curved culmen. In my experience house finches have small beady eyes compared to purple finches, though this may be a regional trait in southwestern Pennsylvania. Here are some comparison photos of male finches — purple on the left, house on the right. From above: The male purple finch on the left has a rosy back, head and neck. The male house finch has red accents but is overall much browner with a brown back and neck. NOTE! If you see a male that’s orange-red, it’s a house finch. The orange variant is very rare in purple finches. From the front: The male purple finch has a rosy breast and sides with rosy stripes or dots of color on his flanks. The male house finch has brown stripes on his flanks. The flanks are the clincher. The females are a little harder to tell apart because they’re simply brown and white. Again there’s a difference in body shape. The purple finch has a chunkier neck, larger beak with straight culmen, longer wings. The main difference though is in their markings. 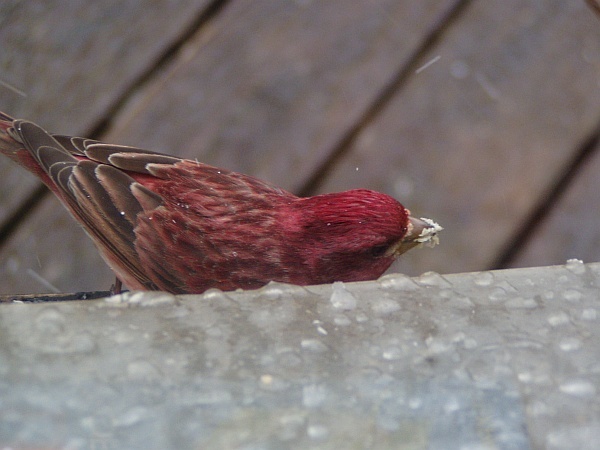 Here’s a comparison photo: female purple finch on the left, female house finch on the right. The purple finch has white areas at her eyebrow and cheek and sharp brown lines or dots on her breast and flanks. The house finch is gray-brown overall and blurry: plain gray-brown head, blurry stripes on her chest and flanks. NOTE: The colors appear very different in these photos mostly because the lighting was different. So when you’re presented with purple and house, here’s what to remember. For the males, look at their flanks. If the flank stripes/dots are rosy it’s a purple finch. For the females, get an overall impression. Is she blurry? She’s probably a house finch. We have tons of house finches year-round, but see an occasional purple. Right now, we are inundated with migrating goldfinches, but of course this time of year they are not gold! They sure are hungry, tho…. from south Louisiana. These are good comparison shots. I have been birding seriously for about 4 years and have yet to see a purple finch. I don’t have a feeder. No worries, a treasure yet to be discovered. I’ll wait until the purple finch sees fit to present itself. Happy New Year! Thanks Kate, this makes the differences very clear!